If you’ve read any points/miles blog or follow reddit churning, you know the big news from this week. 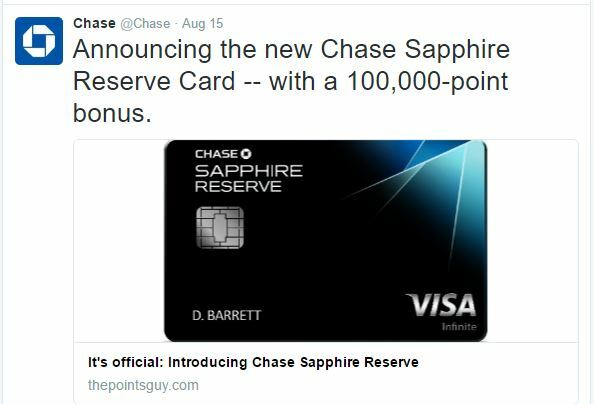 On Monday for about an hour there was a live application link to the new Chase Sapphire Reserve with a 100,000 point signup bonus which wasn’t suppose to be available until August 21st. Well, we think it had a bonus offer because the landing page didn’t state a bonus but then another link was found with the bonus language that linked back to the first page – either way if you applied and were approved on Monday I think its very, very likely you will earn 100,000 points. However, the bigger news was many people were approved for the card despite being over Chase’s 5/24 rule. While it’s still uncertain exactly how everything will play out once the card is publicly available for good, I wanted to share my thoughts on everything Sapphire Reserve related. There is no doubt that for many of us in the travel hacking community this card is exciting and one that many would ultimately like to get. However the one huge issue/question mark is whether this card will be subject to Chase’s 5/24 rule – in that if you have 5 or more credit card accounts opened in the past 24 months (including if you were added as an authorized user), you would not be able to get this card. Here are my various thoughts and opinions about the card, applying for it, the accidental links on Monday, etc..
Obviously it was a mistake that the links to apply for the card were made public for an hour or so on Monday. So much so, that Chase scrambled to “officially announced the card” via their Twitter account by linking to The Points Guy’s post on the card. That’s right Chase announced their flagship credit card product by linking to a blog instead of putting it up on their own website – this tells me they were not prepared for this. And as such, that is why people who were over 5/24 were able to get the card on Monday – Chase didn’t have all the controls in place. I consider these people very, very lucky. There is pure speculation but I have a feeling that when the card is supposedly ready on Sunday for a public launch, Chase will prevent those in excess of 5/24 from getting this card. I do not think there will be a small window of time for us like with the Chase Freedom Unlimited. I think Chase is quite aware of “our community” (I mean they obviously do some serious business with TPG) and knows there will incredible demand from travel hackers for this card. That is not their target market and thus, I think they will restrict it from many churners via 5/24. I hope I’m wrong on this. That said, I think I am going to apply for the card as soon as the link is available just in case I’m wrong. The rewards are strong enough for me to burn a credit inquiry even if it <5% I actually get the card as I am currently at 20 cards in the past 24 months (and that’s not including authorized users which I should count). Applying for the card when it first comes out is probably the best chance to get this card if you are over 5/24. To give you the best chance of getting by 5/24 if its not fully in place when the card launches, you will most likely want an instant approval. I plan to reduce my credit lines at Chase by at least $10k and preferably closer to $15k to give myself the best shot at an instant approval. You do not want eyes on this application and you do not want to call reconsideration for this card. That said, there is risk with this approach as I could be giving up 15k of my credit line (and hurting my credit utilization ratio which hurts my credit score) for no gain. I’m ok with this risk – think about if you are. If you are a Chase Private Client, apply directly through your banker. It is thought 5/24 doesn’t apply to CPC customers. Going back to the above, I full expect Chase to be absolutely slammed with applications for this card on the day it is publicly released. I’ve never seen so much hype about a new card and seeing threads like this only reinforces that. I have no idea what kind of impact this will have but it can’t be good. It wouldn’t shock me to see some benefits cut after a year or so with this card on the market. Lastly, you can expect some ridiculous pumping on the blogs as I’m sure the commissions on this card will be incredible. I’d expect it to be over $300 per conversion (using this list as a very rough metric) that your bloggers will earn if you use their links. As always, think carefully about what link you use. In closing, I want to stress a lot of the above is simply my opinion on what could happen and I have absolutely no inside knowledge of what will actually happen. I’d love nothing more to be wrong on much of this. Good luck to those going for this card! Thank you for this, I so appreciate your honest thoughts and comments! There is no chance of getting approved and not getting the bonus right? It’s either card + bonus, or no approval at all? My guess is no approval at all. 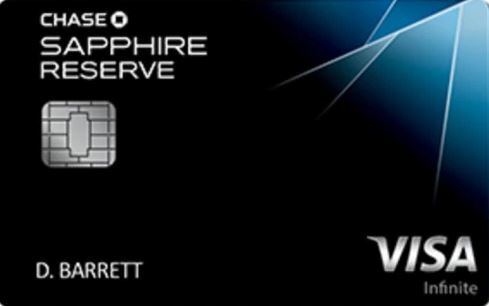 If you want the card without the signup bonus, you might be able to upgrade from a Sapphire Preferred – not sure on this. It was no mistake that Chase linked to TPG. Bankrate owns ThePointsGuy blog and they’ve spent years going after blogs telling them to delete Chase card reviews. Now we can see that Chase was behind them in this and probably have an investment in Bankrate. The smaller bloggers have lost out due to this anti-competitive behavior and should put together a lawsuit. Chase doesn’t need it’s own blog nor does it need smaller bloggers since it has had the TPG in its hands to use as its main promotional tool. I decided to take your lead and reduce my CLs on several Chase accounts and free up $15k of credit. I had a ridiculous amount on my Ink card, anyway, and I don’t MS anymore like I use to do, so it doesn’t bother me much to try. Thanks for the idea. Never a need to consider what link to use when applying for a card. Because one should NEVER use a link that gives a cc pimp money for using your good credit. Give your heads a shake if you are one of the idiots who does use blogger links – just what do you think was the cause of the huge tightening from the cc companies in the past few years? And how about all the MS methods and products that evaporated? They are in direct proportion to the amount of pimps shoveling CC apps in readers faces every day.